Red Velvet Cake and Red Velvet Cupcakes are my, hands down, absolute favorite desserts. I ADORE them. But the typical Red Velvet Cake Recipes are full of fat, calories and of course, extra Points. So when I came across this Weight Watchers Recipe for it, I was beyond excited and couldn’t wait to try it! When I read through the recipe, I was concerned about the icing because I REALLY like a thick buttercream, cream cheesy icing on my red velvet, but it turned out to taste pretty darn good! The icing is definitely lighter and fluffier than I’m used to, but it still tastes fantastic, and it’s a fair compromise for just 4 Weight Watchers Points per serving. This is the perfect low calorie dessert recipe to take to any party or dinner and of course, it’s a great treat to make at home as well! When I made this recipe, I made 15 Red Velvet Cupcakes from the mix, so that I had my portions already divided out. If you love Red Velvet Cake, you’ve gotta give this Weight Watchers Red Velvet Cake Recipe a try and satisfy your sweet tooth without the guilt! A moist, low calorie red velvet cake that is simple and easy to make. You’ll love this guilt free dessert! Mix cake mix and diet soda. Pour in 13?x9? pan sprayed with Pam. When thickened, spread on cake, then top with the cool whip. Cut into 15 equally sized portions. My jello box says… 1oz… 4 1/2 cup serving so do I need 2 boxes? Anyway i can get the netrience like calories carbs protein ect.? My jello box states. 1oz 4 1/2 cup servings so do I need one box or 2 boxes? Yes, you’ll need two boxes. Made this for food prep this Sunday to go with your chicken quinoa broccoli bake. It’s sooooo delicious. I used TRUWHIP LIGHT instead of cool whip to make it a hint more “natural” but still used the other ingredients as listed ….oh well ;) YOLO. very good. Thank you! Just in case anyone is wondering, the points plus version is 5 points per serving (based on 15 servings). I made this today and it was great. This was posted in 2009 and not sure if it is really 4 points with WW 360. Any update? 1) Oldest posting of this recipe is from Food.com in 2005. For my recipe I am taking a cue from laaloosh and pre-portioning it into cupcakes. 2) Just recipe built this using my wife’s WW account (I actually inputted the nutritional info of each ingredient into the system and allowed it to calculate the points based on current program calculation) and it actually came out as 2 pts each. My apologies, that suppose to be 5pts not 2points When prepared as as directed and made into 15 servings on the 2014 program. FYI: I made this with half the cool whip and into 16 cup cakes with brought it down to 4 pts. The oldest posting I’ve found if this recipe is from food.com from 2005 the points from that program was 4pt. I am updating this recipe for a technical writing course and replotted the ingredients in the weightwatchers.com recipe builder app and let it calculate the Points for me. It said 2pts per serving. please help..do you just the cake mix and dr. pepper to make the entire cake? or do you use the cake mix and all its directions on the box with the egg, oil AND add the dr. pepper too? Do u mix the cake mix as directed? With egg and oil ? Hello! So, If this was the old Point system….what are the Points + for this recipe? I would like to make this for Thanksgiving! Not sure.. :(. I have to re-make it and re-calculate everything! Made this tonight as cupcakes and they were good! I used a different type of icing since I seen the reviews about the icing listed. Will make again! A suggestion for the frosting – mix the pudding with ONE CUP of milk, let it set up, and then fold the Cool Whip into the pudding. This way it’s a little bit more like frosting. My cake is currently in the oven – can’t wait to eat it! Made this cake this afternoon and we had for dessert this evening, the verdict? Terrific! My daughter and I have been on WW for nearly a year. I’m down 44 lbs and Jess has lost 61. We are always looking for new recipes. This one is a keeper. Very delicious. Even our nonWW guests loved it. Though they had no idea that it was a fatless,guiltless delight. Thank you! Do you know the points for the new points plus? I appreciate it. I haven't eaten yet…but trying to put the icing on was such a pain…it wasn't thick enough- I didn't want to risk the icing getting runny so i didn't add the cool whip but i did stick an extra box of the jello and that helped. ALOT. I made this cake today, but I tried it with a chocolate cake mix. I wasn’t sure how it would turn out with the Dr. Pepper, but it was so yummy! I am telling everyone how to make this great lowfat “soda cake.” I think the next one Im going to try is a cake mix with a fruit flavored soda! Thanks for the tip! I love your recipes! I just used this receipe for my last class of the semester, and they were a hit! nobody notice the diet soda, but the loved the favor. didn't like the frosting as much, so i used a light whipped cream cheese frosting. Also I added one tablespoon of dark cocoa powder, add to the favor too! Thanks for the receipe!! I have a red velvet cake mix that is 1lb 10.66oz. Should I just use a little bit more soda? Thanks. Yes, that will help keep the cake mix moist enough. I've looked at several stores, and i haven't found a fat-free, sugar-free kello instant cheesecake pudding mix :( would you recommend using something else?? An authentic Red Velvet Cake’s frosting is an Ermine Buttercream flavored with vanilla. You could make a mousse type of frosting with cool whip and instant vanilla pudding. What is this rage about cream cheese frosting on a red velvet cake? It doesn’t belong there. Marina – I'm in the same boat, counting calories. I actually calculated the calorie content by adding up each ingredient separately. The total calorie count is 1134, for 1/15 of the cake or 1 of 15 cupcakes it's 75 calories. Hope this helps! Is this current for the Points Plus program? Do you use mini cupcake pans? Thanks! This recipe is currently listed with the old Points values. Also, I used a regular cupcake pan, not a mini. Thanks for reading! 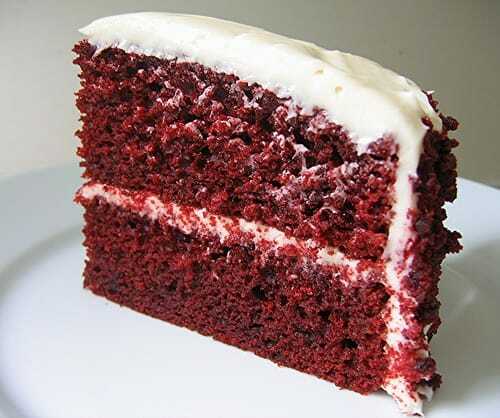 Like everyone else on here, I am on a diet, and totally craving Red Velvet cake. However, unlike everyone here, I am not on weight watchers, so i'm counting calories instead of points. Would you happen to know how to convert points into calories, or just know how many calories are in each serving? Thanks in advance. Each red velvet cupcake has 4 points. I have this recipe cooking as i type this. I have just started WW and today is my hubby's birthday. His fave cake is red velvet..so im anxious to find out how this tastes. I hope he likes it as well. I've made other diet soda recipes, and used the whole can of soda. Is it correct that I will NOT use the whole can for this recipe? Thank you. I'm anxious to try the recipe…and especially with the icing. This recipe was absolutely delicious. I have been watching what I eat (not officially weight watchers) and have been craving red velvet cake for weeks now. This definitely hit the spot! Thank YOU! I agree with Luanne. I have lost over 40 lbs in the last 5 months with weight watchers and I do not eat chemicals. I cook for myself and my daughter and cannot imagine feeding those chemicals to my little girl or eating them myself. I eat the real thing but just eat a proper portion size. Now why would anyone make a cake with all of these fake ingredients? They are just chuck full of chemicals. I mean diet soda (saccharin) fat free and sugar free pudding (ick) and cool whip that has oils that clog your arteries. Why would you put this junk in your body? I believe Julia Child's philosophy. Have a small piece of the real thing. You'll be more satisfied than eating large quantities of something with low quality ingredients. have you ever heard of the saying : "
if you don't have anything good to say, shut the hell up" lol leave us who are excited about this recipe alone! This cake is wonderful!!! I just started WW a few weeks ago and was craving something sweet! I may never go back to "regular" cake again!!! (And I love, love your website)!!!!! Thank you anyway! Ill just make him eat it! it looks too good not to make! This cake looks amazing. I am trying to find a lower carb version for my dad's birthday, Is there anyway you can tell me about how many carbs are in this recipe? Yum. Just made this cake and LOVED it. Thanks for sharing. What would the point value of the cake be without the icing??? I'm looking to skimp on the points, but still get a sweet treat at the end of the day! Thanks!! P.S. I have been making all of your recipes for the past two weeks and my whole family has no idea they are eating healthy!!! The point value of the icing, per serving is about a 3/4 of a Point, so it really may not be worth it to cut that fabulous flavor. Maybe try cutting each serving in half — you'll cut off 2 Points that way. Do I use Dr. Pepper instead of the eggs, oil etc. or in addition to the ingredients required on the box? You use the Dr. Pepper instead of the ingredients on the box. Just ignore everything that's on the box. :) Enjoy — it's deeeeelish! How can I make this as a two layer or bundt cake? As for how to make this into a bundt cake, I really don't know. But to make it a two layer cake without changing the weight watchers points value, just take a cake slicer, and slice the cake into two layers, or divide the batter into two pans before baking. I was wondering if we could make this cake into cupcakes, so the portions are equal 15 cupcakes. Just wondering. Absolutely! I love this idea! And it's the best way to make sure those portion sizes are controlled. The part I don't understand is about the cool whip. Do you need to spread it over the icing for it to taste right? I just really hate coolwhip, but I don't want to mess with the flavor that the recipe is going for. Ahhh, yes…you are in good company…many do not like the taste of Cool Whip. What you can do instead, is mix the Cool Whip in with the pudding mixture. That way, it kinda disguises the taste of the cool whip. Just be careful not to over mix them, as that might make the icing a bit runny. I love your recipes!!!!! I have been on Weight Watchers since 1/3/09 & have lost 25 lbs, & have used a number of your recipes. It is wonderful that you do this. It definitely makes cooking, eating & losing weight so much easier when you know you are eating healthy. Thank you!!!!! Thanks so much for your kind words! It sounds like you are really rocking the WW program, and I'm so glad all the Weight Watchers recipes have helped you. Congrats on your success!! And I hope you keep enjoying all the low calorie recipes! I am so excited about making this, but I am confused by one of the ingredients. You have written 1 8oz pkg jell-o fat-free, sugar-free instant cheesecake pudding mix. This doesn't make sense–the small (4-serving size) jell-o boxes are 1oz, the larger (8-serving size) boxes range are 3.75 oz. Help! I have everything else ready to go and I'm anxious! You'll want to use the larger package of the jell-o mix. The 8oz refers to the amount of prepared mix. But it's confusing. I've corrected the recipe to show the correct ounces! Thanks so much for pointing that out! how do you figure out the numbers for the food?? Your reicpes are all new and from you, so how do you do it? I have some recipes that I have changed to make 'healthier' but do not know the new numbers. HELP!!! It takes some time at first, but I calculate the Weight Watchers Points based on the information on the food labels of the ingredients and the amounts of what I use. If you are reworking old recipes, you'll have to add up all the nutritional stats and then divide it by the number of servings, and then use the Weight Watchers Points Calculator to determine the Points value. That cake looks beautiful and so tasty. I WILL be making this one next week. I just made it with the diet soda and no frosting. but this looks so much better. Thanks for posting.